Polish multihull specialist Sunreef Yachts has revealed its latest sailing catamaran design – the Sunreef 70. The 21.4 metre “classically inspired” yacht joins the three other models that make up the yard’s sailing catamaran range – the Sunreef 50, 60 and 80. Boasting “outstanding living spaces”, the Sunreef 70 is fully customisable. Accommodation will be for a total of eight guests but “an infinite variety of layouts and decors” are available. Built from composite, the yacht has a beam of 10.8 metres and will be equipped with a pair of 180hp engines. The yard revealed it has already begun construction on the first unit of the model which is due to premiere later this year. 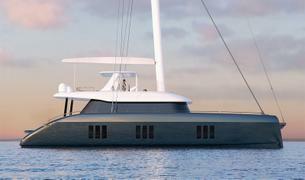 The news comes after Sunreef Yachts unveiled its latest power catamaran design, the 36.6 metre 120 Sunreef Power. Meanwhile, in November, the second hull in the Sunreef 80 series was delivered. The 24.4 metre composite catamaran was delivered at the Gdansk based shipyard following successful sea trials in the Baltic Sea.